Economics Minister Naftali Bennett reacts to horrific Brussels attack by urging world Jewry to embrace religious, national identity . Economics Minister and Jewish Home (Bayit Yehudi) Chairman Naftali Bennett responded to news of Saturday's shooting attack at Brussel's Jewish Museum, urging world Jewry to embrace - rather than reject - its heritage as a weapon against anti-Semitism. 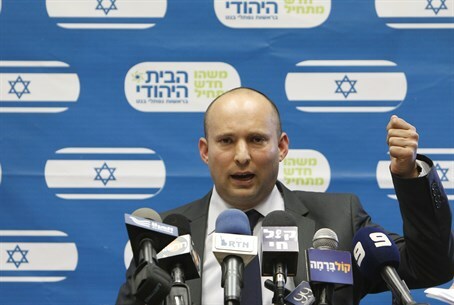 "Shabbat ends and I hear about a murderous terrorist attack, an anti-Semitic attack at the Jewish Museum in Brussels," Bennett stated, in a Saturday night Facebook post. "Hatred towards Jews has existed for thousands of years, and it reached its darkest hour in the European continent." Bennett noted that the face of anti-Semitism is changing. "In this generation anti-Semitism has disguised itself as anti-Israel or anti-Zionist," he said. "Why are there people who hate the Jews? That is just the way it is. Why are there people who hate Israel? That is just the way it is. Bennett urged world Jewry not to turn away from Judaism and Jewish identity as a result of the violence - but rather, to embrace Judaism as the antithesis to hate. "There are some Jews who believe that if we are nice enough and enlightened enough, if we do away with our Jewish symbols, that the anti-Semitism will disappear," the minister said. "It is actually the opposite." The same is true of national identity, in his eyes. "There are some Israelis who believe that if Israel is nice enough, and enlightened enough, if we free ourselves from our nationalism, that the hatred of Israel will disappear," he continued. "It is actually the opposite." "So what should we do? Be ourselves," he concluded. "Live on our land, with great Jewish pride." "The hearts of the entire nation of Israel are with the families of the victims in Belgium."